Almighty ever-living God, who gave Saint Anthony of Padua to your people as an outstanding preacher and an intercessor in their need, grant that, with his assistance, as we follow the teachings of the Christian life, we may know your help in every trial. Through our Lord Jesus Christ, your Son, who lives and reigns with you in the unity of the Holy Spirit, one God, for ever and ever. Can Catholic Parents Thwart a Religious Vocation? 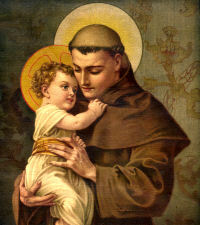 St. Anthony was born at Lisbon, Portugal. He bacame a canon regular and then a Franciscan preaching the Gospel everywhere in Portugal and Italy. Both as a theologian and as a popular preacher he fought vigorously against heresy. His preaching was inspired by the love of God and of souls and had an extraordinary power of conviction; it was filled with the penetrating power of the Bible. Pope Gregory IX, who heard him preach, called him during his lifetime the Arca Testamenti, meaning "the living repository of the Holy Scriptures" and Pope Pius XII, when he proclaimed him a Doctor of the Church, declared that he based all that he said on the texts of the Gospels, and could justly be called the Evangelical Doctor. St. Anthony lived for a time in France, but chiefly in Italy, and died at Padua in 1231 at age 36, with the reputation of great sanctity. From the day of his death innumerable miracles caused the faithful to invoke him as a wonderworker of untiring benevolence. Anthony is one of the most popular saints in the Church. He is the patron of lost things and numerous other causes. In Brazil, he is considered a general of the army; he is the patron of the poor and has been recognized as a wonderworker from the moment of his death. He was born in Portugal and entered the Augustinian monastery of Sao Vicente in Lisbon when he was fifteen. When news of the Franciscan martyrs in Morocco reached him, he joined the Franciscans at Coimbra. At his own request, he was sent as a missionary to Morocco, but he became ill, and on his return journey his boat was driven off course and he landed in Sicily. He took part in St. Francis' famous Chapter of Mats in 1221 and was assigned to the Franciscan province of Romagna. He became a preacher by accident. When a scheduled preacher did not show up for an ordination ceremony at Forli, the Franciscan superior told Anthony to go into the pulpit. His eloquence stirred everyone, and he was assigned to preach throughout northern Italy. Because of his success in converting heretics, he was called the "Hammer of Heretics" and because of his learning, St. Francis himself appointed him a teacher of theology. St. Anthony of Padua was such a forceful preacher that shops closed when he came to town, and people stayed all night in church to be present for his sermons. He became associated with Padua because he made this city his residence and the center of his great preaching mission. After a series of Lenten sermons in 1231, Anthony's strength gave out and he went into seclusion at Camposanpiero but soon had to be carried back to Padua. He did not reach the city but was taken to the Poor Clare convent at Arcella, where he died. He was thirty-six years old, and the whole city of Padua turned out in mourning for his passing. He was canonized within a year of his death and was declared a Doctor of the Church by Pope Pius XII in 1946. Patron: Custody of the Holy Land; against shipwrecks; against starvation; against starving; American Indians; amputees; animals; asses; barrenness; boatmen; Brazil; diocese of Beaumont, Texas; diocese of San Antonia, Texas; domestic animals; elderly people; expectant mothers; faith in the Blessed Sacrament; Ferrazzano, Italy; fishermen; harvests; horses; Lisbon, Portugal; lost articles; lower animals; mail; mariners; oppressed people; Padua, Italy; paupers; poor people; Portugal; pregnant women; sailors; seekers of lost articles; shipwrecks; starvation; starving people; sterility; swineherds; Tigua Indians; travel hostesses; travelers; watermen. Symbols: The Holy Child on a book; lilies; fishes; flask and crucifix, mule; money chest and human heart; heart (symbol of Christian charity); fire (for religious fervor); portrayed holding a book, bread, Infant Jesus and or a lily. St. Anthony was a great lover of the poor. Deprive yourself of some treat and put the money saved in the poor box. St. Anthony's Bread refers to an episode told in the Rigaldina, the oldest life of St. Anthony. A Paduan mother, who lived near the Basilica during its construction, had left little Thomas, her 20-month-old son, alone in the kitchen. The little boy, while playing, ended up head first in a tub of water. His mother found him lifeless. She screamed desperately but she didn't give up. She called on the Saint. She made a vow: if she obtained the blessing of her child back to life, she would donate to the poor bread equal to the weight of her son to the poor. Her prayer was answered. Read more about St. Anthony's Bread. St. Anthony is invoked by women in search of good husbands, so if you're single and in search of a spouse, today is a good day to make a visit to a church or shrine dedicated to St. Anthony to make your petition to this generous saint! Because St. Anthony was buried on a Tuesday and many miracles accompanied his funeral, Tuesdays are special days of honoring him throughout the year. It is customary to pray a Novena to him on thirteen consecutive Tuesdays. In Franciscan parishes or churches dedicated to St. Anthony there might be a Blessing of Lilies and/or Blessing of St. Anthony's Bread. The Franciscans and The Companions of St. Anthony.